WATCH "ABOMINABLE" - THIS SATURDAY, MAY 20TH AT 9PM on the SCI-FI CHANNEL!!! 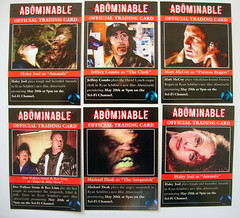 More trading cards designed by me for the film Abominable. Official website here. I figured we'd need a few of "the girls" to entice the male populous to the movie. Hehe. WATCH "ABOMINABLE", SATURDAY, MAY 20TH, 9PM on the SCI-FI CHANNEL! The almost full set of promo trading cards I designed for my friend (and director) Ryan Schifrin. I still want to make a Lance Henriksen, as he's in the film as well. GORE! SUSPENSE!!! FUN!!! BABES!!! And a SASQUATCH!! !